While much progress has been made toward passing compromise legislation in 2016, our efforts are being stymied by a handful of large national public employee and teacher unions, which seemingly have their own agenda – an agenda that differs from our own. These groups, namely the National Educators Association (NEA), continue to promise their members that full repeal of WEP and GPO are achievable goals. Short of full repeal, the NEA and their cohorts have refused to offer their own ideas as to how to improve H.R. 711 in a manner that will pass Congressional muster. The development of H.R. 711 has taken place over the course of the past two years, with input sought from all affected parties. Despite repeat calls to participate in the process, the NEA has not offered any concrete proposals. We should point out that here in Massachusetts, both the Mass. Teachers Association (MTA) and the American Federation of Teachers Mass. (AFT) are allies of our Association and have followed the progress of H.R. 711. The MTA is the local affiliate of the NEA. Officials with AFT Mass. have helped facilitate a productive dialog with the national AFT. The Boston Teachers Union, an AFT affiliate, openly supports H.R. 711 and has endorsed the need to compromise. Our Association’s history with these issues dates back to 1983, when we were one of the first retiree associations to publicly oppose the WEP and GPO. Calling the laws “a mistake”, we then urged Congress to reconsider their action and repeal the two laws. Our Association, along with our coalition partners and Congressional supporters, does not believe that full repeal of the WEP or GPO is achievable now or in the future. Sadly, thirty-three years have now passed without any measurable progress to repeal either law. Meanwhile, tens of thousands of Massachusetts’ public retirees have been harmed by the WEP or GPO laws – losing thousands a year in Social Security income. For more than three decades we, along with retiree groups and employee unions across the country, have worked as hard as possible to fully repeal both laws. Despite these efforts and with both Democrats and Republicans each having controlled Congress and the White House at various times, we have never been able to advance legislation forward. Widespread national support to fully repeal the WEP or GPO has never materialized and likely never will. Not only is such a fix highly expensive, but, some would argue grants public retirees an unfair boost to their Social Security benefit. Meanwhile, nationally over 1.7 million retirees currently fall victim to the WEP. Each year the number continues to grow rapidly as our workforce ages. Working hand-in-hand with our colleagues in Texas and Ohio, we have helped formulate the compromise bill known as H.R. 711 aimed at reforming the WEP law. 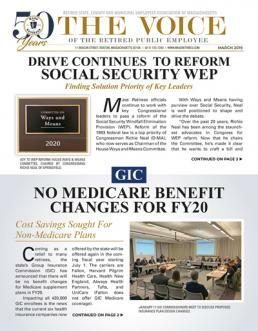 The bill would restore some of the Social Security benefit lost by current retirees, as well as create a new, fair retirement formula for all future Social Security beneficiaries (details can be found on Page 1). While not a perfect outcome, H.R. 711 offers a good solution to a decades-old problem. If passed, current retirees impacted by the WEP would see their Social Security benefit rise. And all future retirees would receive a Social Security benefit that accurately reflects time they worked under Social Security vs. time they worked under a non-covered plan (i.e. public pension). In terms of spouses harmed by the GPO law, we have received assurances from Congressional leaders that the issue will be taken up under subsequent legislation. Reason being for the delay is simply that WEP and GPO apply to two different groups of retirees, with a fix for the GPO being far more complicated to resolve. Finally, we fear that the political dynamic that exists in 2016 presents the best opportunity to pass a WEP fix that is unlikely to exist in the future. Of no small significance is the fact that the lead sponsor of H.R. 711 is House Ways and Means Chairman Kevin Brady. The lead cosponsor is Richard Neal, a senior member of the Democrat leadership in the House. Brady and Neal are in an optimal bipartisan position to pass a bill in 2016 that will put money in the pockets of deserving retirees. Our coalition is now working closely with the International Association of Fire Fighters (IAFF) and other groups interested in passing a compromise bill. We welcome the input of the NEA in the hope that we can finally pass this reform in 2016. We ask all Mass Retirees members to call upon your former national union to engage with us in this process. Waiting for a perfect solution to materialize will only lead to more pain and financial hardship for retirees impacted by the WEP.